I am a self proclaimed member of Lord Of The Rings (LOTR) cult. I have watched the movie series recently just an year ago and I am still reading Tolkien's work but that quote above is responsible for my admiration for the writer. It was a time when I began having serious questions about Capital punishment. It is a debatable topic with many countries against Capital Punishments. Reading Buddhist philosophies filled me also with doubts whether that's the right way of meting out justice to criminals as I have began to see life and death as something not to be decided by mankind except, of course, in the cases of need for survival like self-defense. 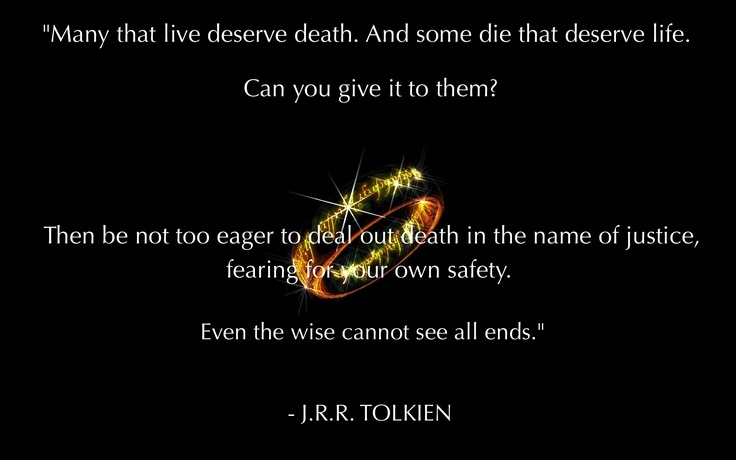 And while watching LOTR when I heard these lines stated by Gandalf to Frodo, immediately it cleared my mind about what and why I should believe. For those who haven't watched the movie Frodo who was full of goodness wants to kill Gollum who was evil when he gets the opportunity but the above advice from his mentor, Gandalf, stops him from doing so and he leaves the filthy creature to its fate. In the end Frodo is about to succumb to evil when Gollum's timely interruption blinded by it's own selfishness saves him. The natural unfolding of the events proves to be the saving grace for Frodo. Had he killed Gollum previously, it would have proved fatal to not only just Frodo but to the whole world. As Gandalf say to Bilbo Baggins, "True courage is about knowing not when to take a life but when to spare one". What a deep philosophy! The message is simple, we never know what is the role each of us play in the cycle of life and death. It is the providence and law of karma that decides our future and we are too small and naive to understand that. 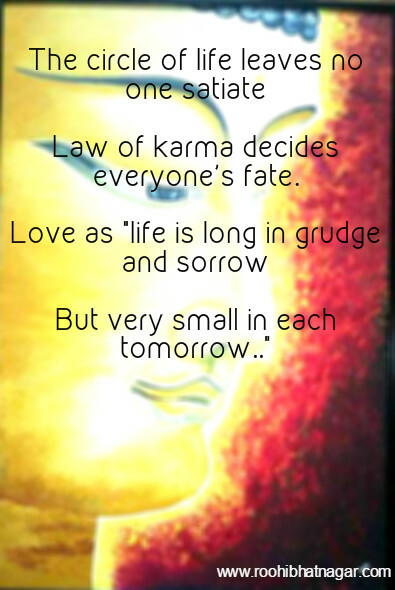 And that brings me to a quote from my poem Karma and Fate, written by Piyush and me. - Post a favorite quote of yours for 3 consecutive days, obviously a different quote each day from any book, any author of your choice. It could also be your own quote. - Nominate 3 bloggers with each post to challenge them. - Thank the person who nominated you. I am thankful to Salvi Prasad for nominating me to 3 day Quote Challenge. 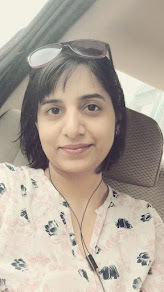 I personally like all such challenges that do rounds in the blogging circle :) Just tweaking it a little. I am adding my own quotes along with the ones that have inspired me. Self proclaimed member of Lord Of The Rings (LOTR) cult had me in splits. ''Life is small in grudge and sorrow..but very small in each tomorrow." Loved these lines Roohi. I agree that seeking revenge gives rise to a vicious circle. The only way to break it is let go! Put out the first one. Nominated two. Two more days to go. Ditto as SHWETA.. I too have not seen LOTR ... And yes loved it - even the wise can't see all the ends . Watch it Kokila, these kind of movies are reason why I got swayed away from Bollywood! Food for thought. Brings to mind Krishna's discourse to Arjuna on a related subject. Well, Krishna's quote is about duty. In war, it is about survival. You can't avoid killing else you would be killed. Incidentally, LOTR is full of wars and romance of valor. :) but this quote is about the time when good is strong and evil is weak.. Even the wise cannot see all ends. I completely agree, Roohi. I love your quote on Karma, Love and Life, particularly the last two lines. It is so meaningful. I should Thank you for that Salvwi for nominating me for a challenge..
An interesting take on capital punishment.